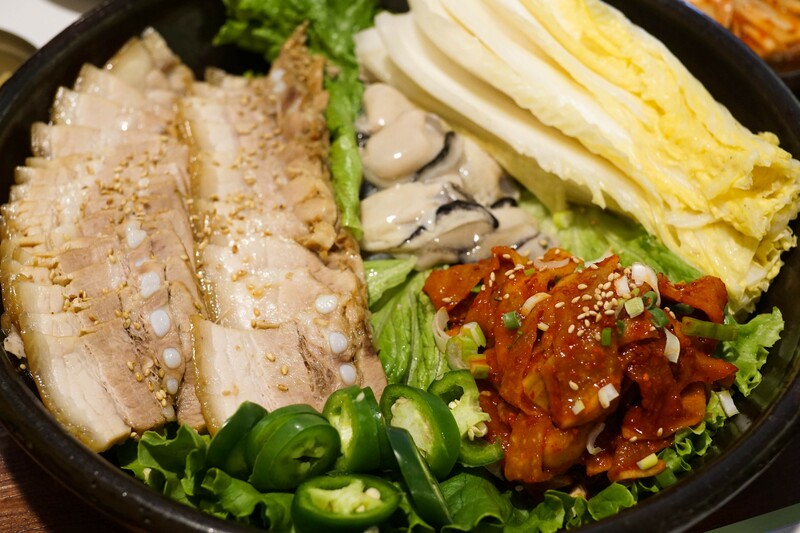 Nestled in a tiny shopping center off Fullerton’s long stretch of Euclid, right past Bastanchury Road, stands Samgeoli Korean restaurant. Here you won’t find tabletop grills, all-you-can-eat Korean BBQ or KFC (Korean fried chicken) – instead you’ll find specialty dishes, hearty stews and profoundly intense master sauces and condiments – it’s a hole-in-the-wall establishment serving up unapologetic homestyle dishes. The dining room fills up quickly at lunchtime, with mostly customers eating in and a few to-go orders. Sit down to an assortment of banchan that comes spicy, fermented and pickled; these tasty side dishes can be refilled so don’t be shy to ask for more kimchi. 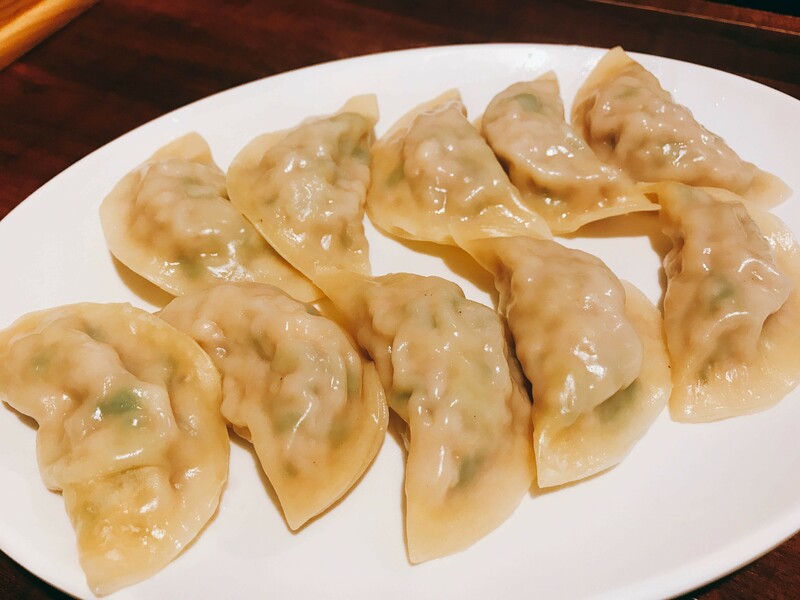 A great starter is the steamed mandu (dumplings), little pockets of pork stuffed deliciousness are filled with cabbage, green onions and transparent glass noodles. This dish, along with haemul pajeon, a crispy seafood scallion pancake are great for sharing. Samgeoli offers a variety of rustic soups, choose from meaty brisket-based suk uh gom tang, milky seolleongtang (ox knee soup) that simmers for several hours until the broth becomes rich and creamy or try the nutritious samgyetang (ginseng chicken soup that’s typically enjoyed in the summer); it consists of a whole young chicken stuffed with rice, ginseng root, aromatic herbs and lots of garlic. Dried red dates add a sweetness to the starchy, salty broth. Expect to see steaming goat meat stews, silky doenjang-jjigae (soybean paste stew) and yukgaejang (spicy beef stew). For layers of umami order the bossam – the ingredients come deconstructed on a large circular cast iron plate and it’s served with slivers of daikon kimchi and funky dipping sauces. 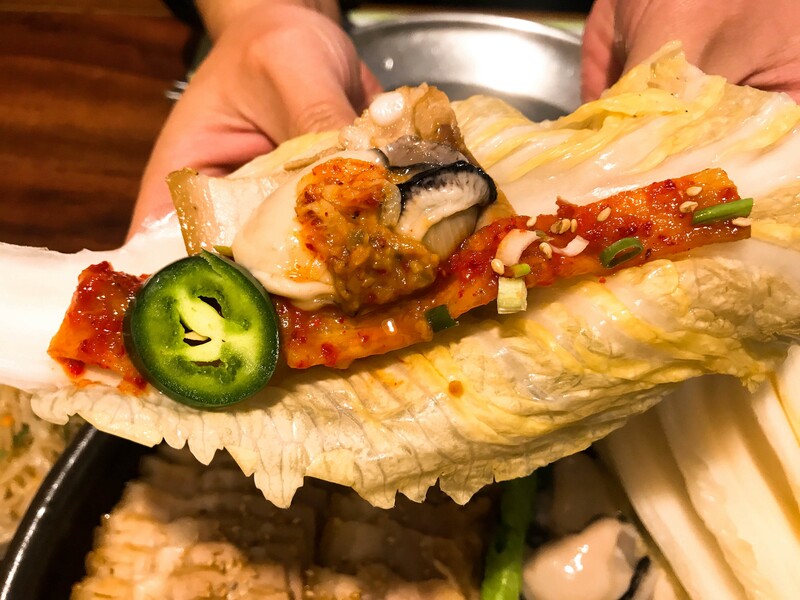 To eat, put a piece of the pork belly in the middle of a napa cabbage leaf, top with raw oyster, daikon kimchi and light smear of doenjang (fermented soybean paste) or a dab saeujeot (salted-fermented tiny shrimp sauce) for a pungent kick. Bundle it up and enjoy the briny flavors from the raw oysters intertwined with slices of sweet pork belly. This dish can easily feed 2-3 people. Remember to balance out all the food by munching on kimchi between bites, it’s a natural probiotic that’s not only delicious but will help you break down everything you’ve eaten. And for those that partake in spirits, the restaurant offers various soju like South Korean Chamisul, Saan (a distillation of sweet potatoes, rice and barley) and Kloud beer (a Korean Lager from Lotte). 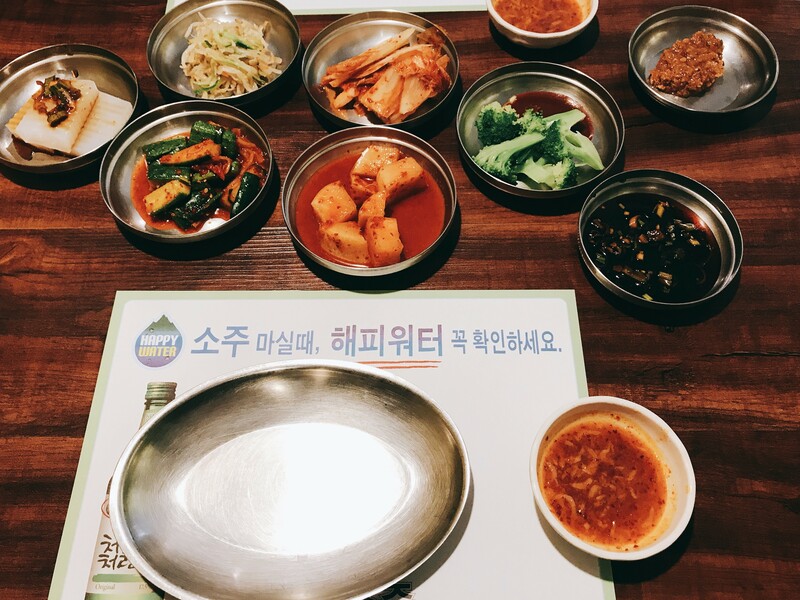 Come to Samgeoli for a spectrum of flavors and unique dishes that speak to wonderful Korean fare and enjoy the banchan that never ends.